On a dead end street in Springfield lies a hidden gem. Alan Axler's Springfield Smoked Fish produces some of the finest seafood available. Luscious, sublime and heavenly, their delicacies would make any meal or get together a special occassion. His recipe for Axler's Smoked Salmon Mushroom Caps is always a holiday hit with the Cecchini's. In a skillet, sautee onions in margarine. Add mustard, pepper, Worcestershire, and Sherry. Stir. Remove from heat. Add sour cream and mix well. Stir in Axler's Smoked Salmon and set aside. Remove stems from mushroom, fill caps with mixture. Top with bread crumbs and parsely. Place on cookie sheet and bake at 350 degrees for 20-25 minutes. NOTE: Parmesean cheese may be substituted with bread crumbs. Bluefish is one of my favorite treats from the sea. Several years ago I enjoyed Bluefish Pate at Legal Seafoods. I was in love. When ever my father caught a bluefish I would start thinking about that pate and what I was going to do to try and recreate it. Then I came accross this recipe from Springfield Smoked Fish that is even better. Combine ingredients in food processor. 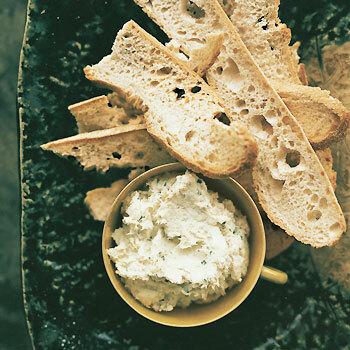 Blend and spread on toasted baguette, rye crisps, or your favorite cracker.